>> A random facebook post made me dig out my model 4P which has never worked as long as I’ve owned it, it’s always just sat on a shelf looking cute. >> Good old ASTEC PSU problem so I fixed that, reseated all the thankfully socketed chips and it burst into life. Sort of. I know it’s running because I can turn the brightness up to raster lines and see the pattern actually change when RESET is pressed. With contrast right up I can JUST see the boot logo appear while it reads the floppy. >> Screen pic: http://www.binarydinosaurs.co.uk/trs80Model4PScreen.jpg <http://www.binarydinosaurs.co.uk/trs80Model4PScreen.jpg> - you can JUST see the boot logo, I know it’s not screen burn because it does disappear on RESET and comes back again. > You might check the contrast control. 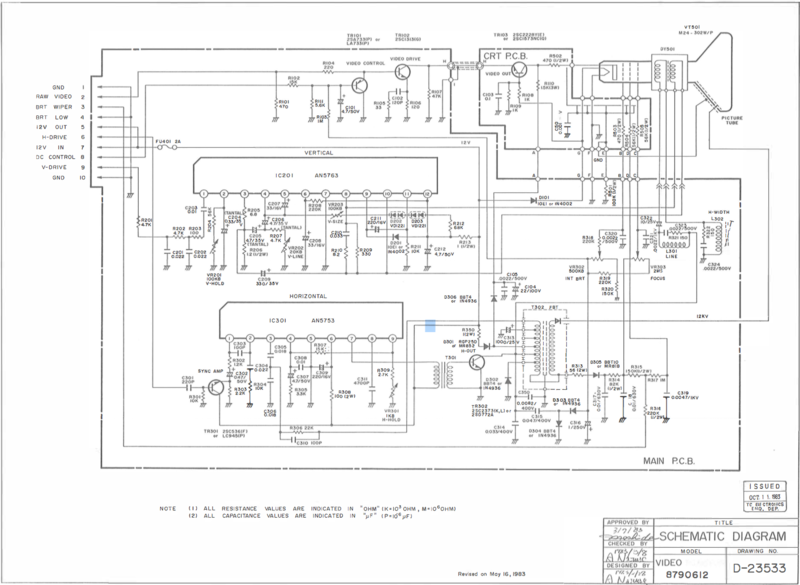 > I can't find the actual schematic for the contrast control connections, but I 'm guessing the ends are connected across 12V (video board pins 5 & 1/4/10) and the wiper to video board pin 8. > The contrast control can be expected to take pin 8 somewhere + to get pixels fully on. You’re right with pin 8, tracing the circuit I can see why someone recommended I check Q101 and Q102 which look OK in my tester. The contrast control itself tests OK resistance wise, it goes from pretty much 0ohms to 610M. > Or get back to us with some voltage measurements at the BCE of TR101, 2 and 3, and at the external connections to the little board on the end of the CRT. > Note that there will (should) be several hundred volts on some of those CRT board connections. > Does the "internal brightness" control on the video board have some effect? Yes, it works with the external control. It was the first thing I checked last night.